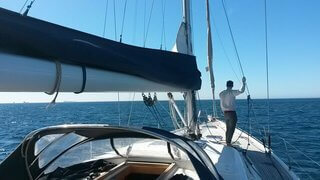 Skippered yacht charter on Galway Bay and The Wild Atlantic Way - Sleeps 8, with 15 onboard for day sailing. Galway is the pivotal point of Galway Bay & The Wild Atlantic Way. This iconic body of water takes in the coastlines of counties Galway, Mayo, Clare & Donegal.Custom build your own cruise to freely explore what Galway Bay & the West of Ireland has to offer. offering 1 day overnight cruises to the Aaran Islands, or plan your oiwn week long charter. Irish department of transport licensed & equipped to high safety standards, skippers are all certified to yachtmaster level, fully insured with all wet weather gear supplied. The Atlantic 2010 Beneteau Oceanis 37ft, lets you explore the beautiful Galway bay & Wild Atlantic Way in style on a luxury yacht. Ideal for 6 passengers to explore the Aran Islands comfortably over a few days. She is deceptively spacious and comfortable both on deck and below. As well as her sleek lines and modern design, she is fun and fast to sail. Irish DOT licence, includes all safety gear & Clothing. A Customized 54 ft ocean-going sailing yacht, built in Germany by Hanse. Extensively customised to cater for Corporate Clients. All passengers are fully catered for with quality wet weather gear and safety equipment. Skippered charter on Galway Bay & around the Aaran Islands - P5 boat licensed boat for 12 people. Ideal for bird and marine watching, charter for the day and explore where coonemara meets the Aaran islands, with a local skipper who know the water. Also availble for sea fishing charter.